When I think of spa treatments — which is not a frequent occurrence, by the way — I always picture myself in a soft robe with a towel on my head, a drink in my hand and a slice of cucumber on each eye. So, yes, my idea of a spa treatment is devoid of the actual treatment and involves what is usually depicted in films and TV series. And that’s because I’ve never had a proper one. I did have a pseudo spa day at home that involved cucumbers, just as I imagined. Sort of. I was only supposed to buy a new cleanser when we (my husband, our daughter and I) went grocery shopping, but as we all know, there are so many temptations idly waiting on the face care shelves of the supermarket. And I gave in! 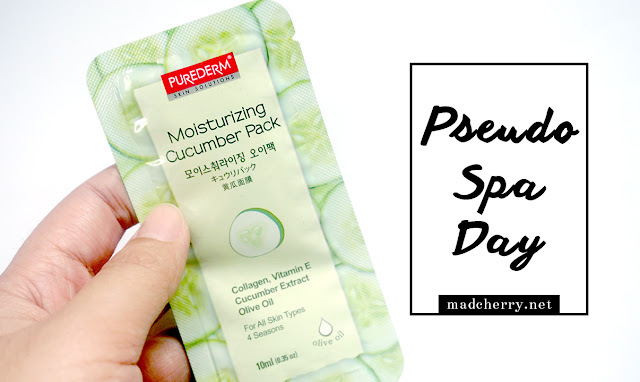 The PureDerm Moisturizing Cucumber Pack spoke to me and said, “Hey, dry skin girl! You need to try me out. I am the cucumber pack of your spa treatment dreams.”* So I did. The PureDerm Moisturizing Cucumber Pack promises two things: brighten and soften your skin with the help of olive oil, and make it as young-looking and fresh as if you’re a toddler with the help of cucumber extract, vitamin E and collagen. It demanded little when it came to application. You just need to start with a clean, dry face before slathering on the cucumber-scented concoction on your visage, except for your eye and mouth areas. Wait 5 to 10 minutes before rinsing it off with warm water. It feels cool on the skin just like an actual cucumber, but it does make the skin itch a bit. My expectations were high, to be honest, and I shouldn’t have set the bar way up. The product moisturized my skin but only a little bit. I was looking forward to having noticeably hydrated skin after rinsing the product off my face but it was still a bit dry to the touch. My daily moisturizer definitely works better than this. Needless to say, I won’t rush to the supermarket to get a new PureDerm Moisturizing Cucumber Pack. Or maybe I would, but just for the cooling effect.This product retails for around P35, I think, so it’s not something you’ll cry over for if it ends up doing nothing. Have you tried this face mask before? What do you think about it? *And that is one of the ways I try to justify my impulse purchases.